JFK’s Russian conspiracy did not begin during his campaign. In the summer of 1960, the Soviet Foreign Ministry and the KGB relied mainly on publicly available information to imagine what Kennedy would be like as president if he won. They had no informants near the young leader’s circle, the “New Frontiersmen.” Soviet diplomats were more dismissive than the KGB of Kennedy, thinking him “unlikely to possess the qualities of an outstanding person.” Both institutions worried he was overly influenced by his father, Joseph, the conservative multimillionaire and former head of the Securities and Exchange Commission. Soviet intelligence initially suspected Kennedy might be more welcomingly inventive in U.S. – Soviet relations. But neither side apparently got any help in testing their theories from the Kennedys or their advisers until November. After Kennedy’s very close election, Soviet diplomats and the KGB made separate approaches to Kennedy insiders to get a read on the future leader of the free world. The meeting of the undercover spy with RFK on Dec. 1, 1960, seemed to be the KGB’s effort to contrive a summit invitation from the president-elect and deliver it on a silver platter to the Kremlin. 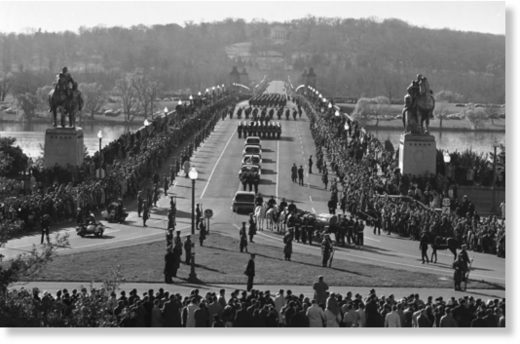 JFK’s funeral. Over the span of 18 hours, 250,000 people, some waiting for as long as 10 hours in a line that stretched over 10 miles personally paid their respects to the President. Tim Naftali, the co-author with Aleksandr Fursenko of One Hell of a Gamble: Khrushchev, Castro and Kennedy 1958-1964 and Khrushchev’s Cold War, is writing a new study of the Kennedy presidency.